Quite apart from the merits of their technology, Marketo does indeed have a reputation for (to borrow a time-worn phrase): eating their own dog food. And aside from the sophistication that no doubt powers when, how, and what Marketo communicates with prospective customers, their marketing creative (which, you could argue, has nothing to do with technology) is pretty darn good also. 1. Header communicates both the topic and offer front and center. 2. Visual image of the offer is featured prominently. 3. Sub-head is a clear, concise business benefit. 4. Body copy is remarkably short (barely more than 100 words) yet manages to communicate all the reader would want to know, namely: WHAT the offer is, WHY he/she wants it, and HOW to get it. 5. Note the 4 separate calls to action (two buttons, two text links) yet at no point does any one seem repetitive or redundant, in part because the two buttons are different designs, and the two text links are different copy. 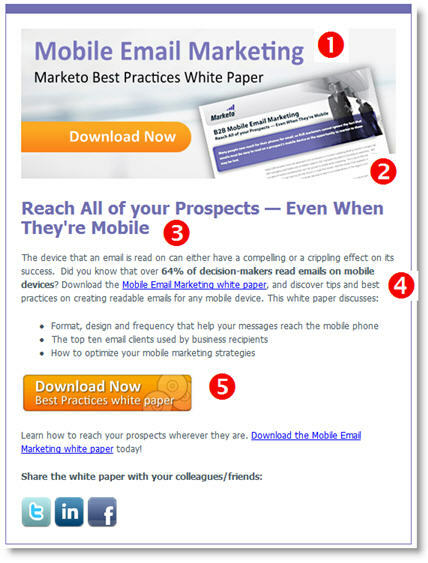 This entry was posted in B2B Marketing, E-mail, email design, email marketing, Graphic Design, lead generation and tagged email design, email marketing, Marketing Automation, marketo on June 14, 2011 by Howard Sewell. Thanks for the great comments. Our marketing is always a work in progress, so we can always improve. Trends change, best practices evolve, and everyone has different opinions of what is good (though I’m pretty fond of yours).